Why online advertising is so effective – Part 3: Interests and Platform - A Digital Marketing Agency | IIAS - International Internet Advertising Services Inc. In this short series, we’re discussing the tremendous value of online advertising. Last week we looked at targeting age and gender, and now we’re going to add platform and interests. 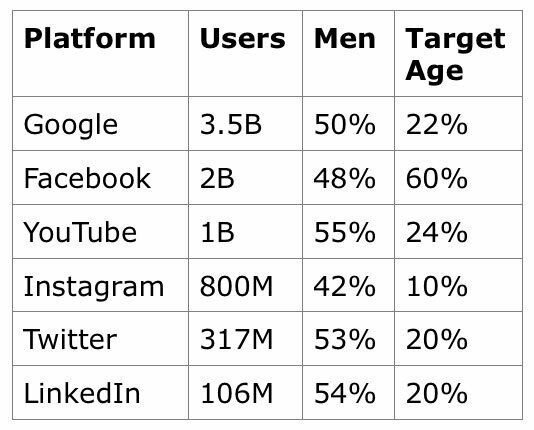 Based on information from spredfast.com and statista.com, I’ve created a chart with number of users and a rough estimate of user profiles that match our target of men aged 46 to 55, for six of the most popular digital platforms. I need to note that there are many (many!) other sites and platforms on which to advertise, so I’m using these only as examples. The Google user data is only for their search engine, and still has the most users by far. While the percentage in our age group is lower than some others, the volume of users makes up for that. They collect data from search as well as other sources, so can target gender and age fairly well. Their forte though, is tracking interests, what they call “affinity,” based on keywords used in search, sites visited, ads clicked on, etc. According to Spredfast, YouTube is the best place to reach a male audience. While men are certainly the majority of users, they don’t have quite as many in the age group we’re looking for. Still, user tracking would allow us to target men in our age group who watched car related videos, subscribed to a car related channel, or even a car brand channel. Instagram has the next largest user volume, but our chart tells us that it is the least likely to deliver a high number of users in our target group. I’m going to say pass. Twitter is popular with men, but not so much with our age group; and, may not be the best format for a car ad anyway. Pass. LinkedIn has far fewer users, but a majority are men. While our target age group is estimated only at 20%, we are still in a pre-retirement age range. In addition, LinkedIn is the most popular platform with Fortune 500 CEOs, and we can target income range, so I’m keeping this one on the list. So we’ve narrowed it down to Google, Facebook, YouTube, and LinkedIn; targeting men, age 46 to 55, who have an interest in cars; and, we’re going to add income of $100,000+, because we can.